In the latest, Deepa and Sreechithran have posted apologies to writer S Kalesh for causing him hurt, but neither has admitted to "stealing" his poem. On Thursday, writer, teacher and occasional orator Deepa Nisanth, teaching at the Sree Kerala Varma College in Thrissur, was accused of plagiarising a poem. The news spread faster than it should because it is Deepa Nisanth that’s involved, a name that often lands up in controversies, a 'bold voice', who first came into the limelight for supporting a beef festival in a college three years ago. In two days, however, there have been too many stories and side stories and twists and turns. The accusation by writer S Kalesh, the explanation, the inclusion of another known name – Sreechithran, a social activist and thinker. There has, however, been no clear admission of guilt or apology so the controversy continues to brew, with newer posts and comments every few hours. As this is written, Deepa and Sreechithran have come out with long posts including an apology for Kalesh for causing him hurt, but neither has admitted to ‘stealing’ his poem. S Kalesh put out the first post on Thursday evening. “It is in 2011 March that I wrote and posted on my blog the poem ‘Angine irikye marichu poi njan’ (I/You died while being thus). I remember it getting a great response. Through that poem, my poetry got many friends. It was later published in the Madhyamam weekly magazine. On the advice of AJ Thomas (writer) who read and liked the poem CS Venkiteswaran (critic) translated it to English and published in English Literature. It was also included in the book Shabdamahasamudram published in 2015,” Kalesh wrote. On Wednesday, his friends sent him copies of the poem published as written by someone else (Deepa Nisanth), the lines unchanged at places and distorted at others, Kalesh wrote. “This poem was printed in the AKPCTA (All Kerala Private College Teacher's Association) journal. I felt sad. What else would I feel?” he ends his post. The poem with Deepa's name came in the latest issue of the journal. 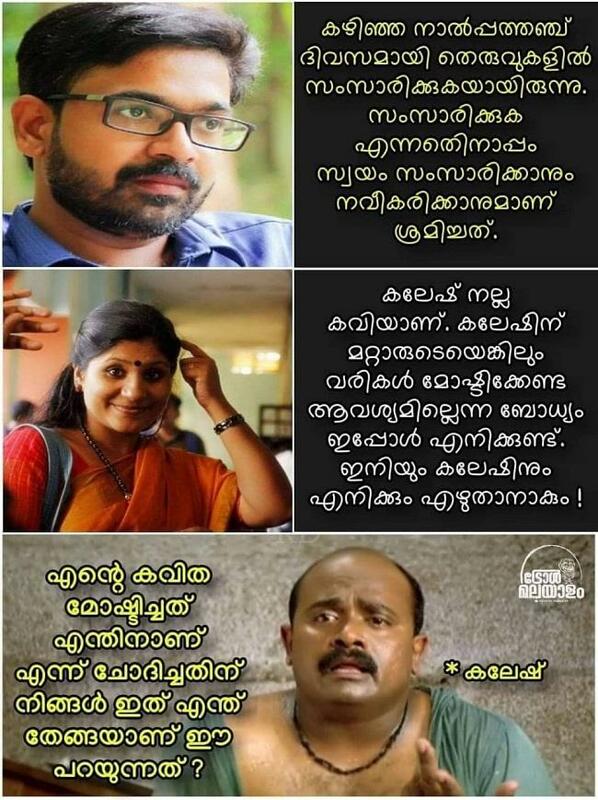 It would not be any sort of exaggeration to say Malayali social media erupted with criticisms, people taking direct and indirect digs at Deepa Nisanth until she was forced to put out a post later that night. That first post she put on the subject was basically a denial. “I have got another badge now, that of poem stealer. Many are saying that I have stolen and published a poem that S Kalesh has written before. Taking advantage of the situation, those who had a problem with my previous stands on issues have begun celebrating. To them, I have only one thing to say. Those who believe that I am someone who steals and gives it to a page in a service magazine to become a writer, can continue believing that. It is the proof that is important, right? We cannot prove the emotional surroundings behind certain writings,” she wrote. She goes on to write that poetry is not her usual platform but those who think that she would do something that could question her whole credibility, simply to be published in a service magazine, should just go on with their thoughts. She would not fall because of this, Deepa writes. Though Deepa wrote a long status, she offered no explanation as to how her poem was similar to Kalesh's. With Deepa not willing to acknowledge any fault, Kalesh said he would be forced to sue her. Just as social media users were coming to a conclusion that Deepa was being untruthful, a new allegation involving a new name came up- activist Sreechithran. An online portal claimed that it was Sreechithran who gave the poem for Deepa to publish. The same portal later wrote an interview of Deepa’s where she says she has been trapped by someone who she can’t name yet. Sreechithran, she said, had put a Facebook post denying the allegations. The post is not there now but online portals have quoted him as denying giving Kalesh’s poem to Deepa. Sreechithran stated that she was a Malayalam teacher and didn’t need it, and that this was character assassination. Sreechithran had been involved in making speeches in cities and remote places across the state to spread awareness on Kerala’s renaissance history. This was in context of the issues that cropped up after the Supreme Court verdict allowing women of all ages to enter the Sabarimala Temple. And now, Deepa and Sreechithran have both put new posts – long ones – that include an apology to Kalesh for causing him hurt. But like we said before, without any admission of stealing his poem. Deepa’s post, published last night, is ambiguous. She writes that she has never had a situation where the credibility of her writing has been questioned. She has never thought of the responses her writing has brought. “My life environment is my inkpot. It is the writing from that, that created and nurtured the Deepa Nisanth of today. It is not a copy of anyone else,” she writes. Deepa, however, does not even bother to explain why she allowed a poem written by someone else to be published in her name, even if that was given to her by a friend and led to believe that he wrote it. (Sreechithran, in this case). 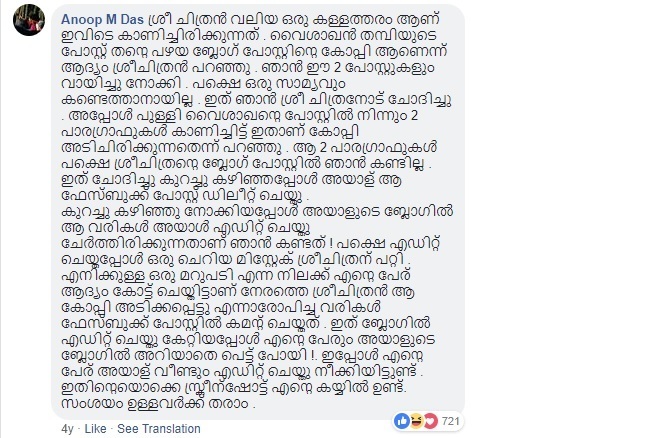 Before going into Sreechithran’s apology, it is important to look at another Facebook post, made by scientific thinker and writer Vaisakhan Thampi. Vaisakhan writes how Sreechithran had allegedly plagiarised his writing, but in a bizarre move, tried to turn the tables on him. Vaisakhan says he was astonished to find Sreechithran’s older blog post and see the same lines he wrote there. He was very upset since the blog he wrote had come out of emotional reasons and in between a hectic schedule. He also writes that if his friend Anoop M Das had not intervened at the right time, he would never have been able to prove his innocence. He then adds a link to his four year old post on the topic. There are some long exchanges in the comments between Vaisakhan and Sreechithran and it is finally Anoop who clears the air again with the explanation. Anoop writes how Sreechithran had at first made the claim of his paragraphs being lifted, but when Anoop read both the posts, he could not find any such plagiarism. When Sreechithran was asked this, he wrote to Anoop pointing out specific lines were lifted. Anoop revisited Sreechithran's blog to find those lines suddenly appear there. But in a hurry, Sreechithran apparently made one mistake, instead of pasting just the lines on his old blog, he pasted the entire message that included Anoop's name too. Since Anoop had screenshots of all these to prove who copied from whom, Vaisakhan was able to prove his innocence. After all this surfaced and possibly facing many questions, Sreechithran put out a post on Facebook on Saturday afternoon, with an apology of sorts for Kalesh. However, instead of saying he had nothing to do with the controversy, this time he admitted to sending a poem to Deepa. “I have sent poems to different people at a time there were discussions on poetry. It is only because of the love for those poems. No one expected it would become such a problem. After so long, to have one of those poems come in a service magazine, and my becoming involved in it and ending up as an accused, is unfortunate,” he writes. And using some word wizardry, Sreechithran once again does not make it clear if he lifted the poem and gave to Deepa. And no direct apology from Deepa or Sreechithran to Kalesh. The jury is still out on who is right or wrong. And even as this copy was being written, there has been a new twist. Deepa Nisanth has released screenshots of her chat with Sreechithran on Thursday night where he portrays himself as the victim of plagiarism, but wants Deepa to apologise for her 'inadvertent error'.